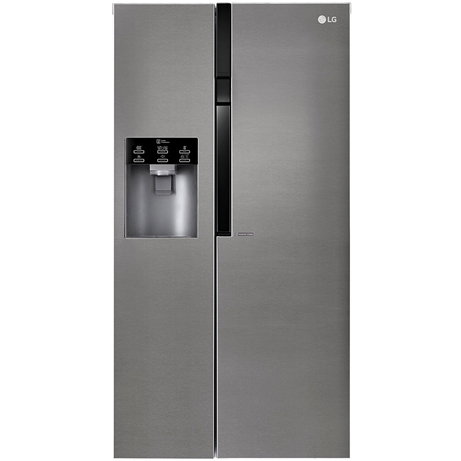 This LG American style fridge freezer is a very modern addition to any kitchen with sleek integrated handles and a modern look. 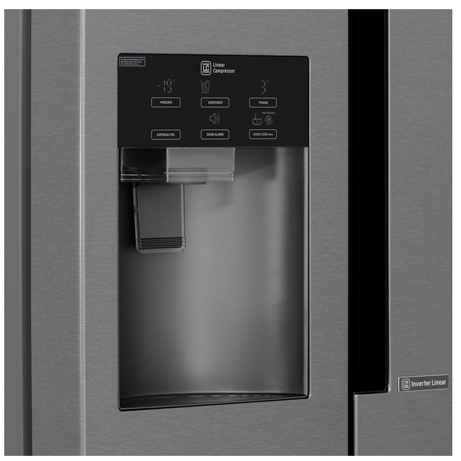 Boasting an impressive 591 litres of capacity and featuring a handy non plumbed ice and water dispenser, there’s lots to love about this model. Never defrost your freezer again, thanks to the No Frost technology which makes for a fresher, cleaner and more energy efficient appliance. It’s energy rating is A++ so you’ll save on your energy bills too! 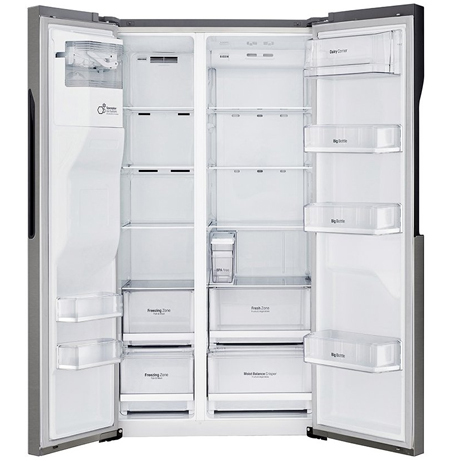 With 591 litres of large capacity, you can enjoy smarter storage and better organisation. Stock up on those daily essentials and store everything with ease. LG’s unique Inverter Linear Compressor uses a linear piston drive instead of a conventional reciprocating drive. This generates less internal friction, resulting in up to 32% lower energy consumption. LG’s Inverter Linear Compressor is also backed by a 10-year warranty. 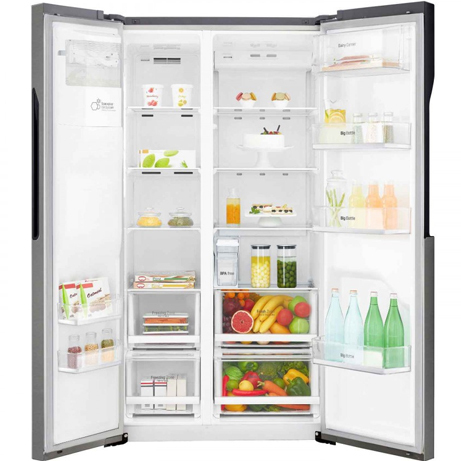 The LG Total No Frost System lets you store and maintain foods at their maximum freshness. The system cools foods faster than conventional cooling mechanisms, which enhances food safety. Plus, cool air is evenly distributed to all areas of the refrigerator so that food stays fresher longer, even for extended periods. LG’s Smart Diagnosis™ is a fast and easy way to troubleshoot issues. Simply call the LG Customer Service Helpline and place the phone on the appliance. The appliance then communicates with a computer that produces a diagnosis within seconds and provides an immediate solution. LED lights are more energy efficient and last longer than conventional light bulbs. They also release less heat, which helps keeps foods fresher longer. Express Freeze boosts ice making and freezing capacity. 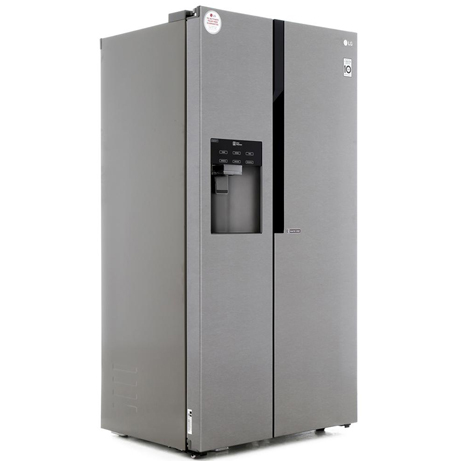 When activated, the freezer runs 24 hours at the coldest temperature to produce more ice. It can also be turned off any time during the cycle. LG’s plumbing free fridges have self-sufficient plumbing systems allowing you to install anywhere in your kitchen with no need to replace the water filter. Compared to regular glass, the tempered glass shelves in LG refrigerators are strong, durable and less prone to cracking and breaking, which means they can also handle heavier items. The digital temperature sensors in LG refrigerators monitor both internal and external temperatures for temperature consistency, helping maintain food quality for longer.